One needs to be extremely accurate while hitting the ball which makes playing golf so much challenging these days. Fortunately, a lot of advancements have been made for detecting the distances by means of some small devices which help in providing accurate distance coordinates. However, at times it is a bit difficult to carry these devices while playing the sport due to their big size. 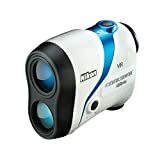 Nevertheless, the astounding Nikon Coolshot Laser Rangefinder happens to be a fantastic gadget for measuring the distances accurately which makes it extremely popular amongst the professional golf players at present. In the subsequent paragraphs, we are going to mention a comprehensive Nikon Coolshot laser rangefinder review which will truly justify its popularity on the golf course. We like to start this in-depth laser rangefinder review by talking about the size and weight of the device. It is highly probable that you have been frustrated quite often because of carrying devices which are too big as well as too heavy for you while playing golf. Since golf demands huge concentration on the part of the golfer, these types of annoying gadgets will simply bother the player a lot. However, having dimensions of 4.4 x 1.5 x 2.8 inches, the amazing Nikon Coolshot laser rangefinder will not allow the golfer to feel much difference while carrying it given that its weight is just 5.9 ounces. Moreover, it can also boast of a compact and elegant design as well. Apart from improving your golf statistics, the trendy design of the gadget will surely make you look really cool. Apart from its convenient size and weight as well as attractive design, the gadget also provides us with some innovative features that help it to stay ahead in the competition. One significant highlight of the rangefinder is the innovative laser rangefinder technology that comes with it. It will enable you to be familiar with the course, comprehend the accurate distance while playing the sport, and, as a result, turn into a better golf player over time. Besides this, it is also very simple to use this device particularly if you own a smartphone. You simply need to press the power button for turning it on and this will give you an instant measurement. Being a device that can be operated with simple commands, you can always rely on it when it comes to precision. The breathtaking Nikon Coolshot comes with a large ocular lens whose size is approximately 18 mm. It will provide you with a quick view once you use it, and it will also consume less time while calculating the distance. Apart from this, you will likewise get a broad view of the course. Another significant feature of the gadget is that it will provide you with a clear and bright image thanks to the coated optics in a multilayer form. Moreover, there is also a priority mode which will help you to scan for a first target. This advanced technology for scanning will offer you outstanding results as well. Because of its light weight, you can easily place it in your pocket or even fasten it to your belt or back while playing the game. In spite of the complicated technology, the device only requires one CR2 lithium battery for operation. The technology used for manufacturing this battery is likewise of high quality given that lithium happens to be an important component of the majority of the smartphones out there. On top of this, the batteries will last for a considerable period of time which means that in case you visit the club every weekend, they are going to last for months together. After going through the above-mentioned Nikon Coolshot laser rangefinder review it should now be clear to you why the device is so popular at present. Numerous golfers are using the gadget across the globe on a regular basis which plays a significant role in improving their game even at the international level. The high technology used to manufacture this device is responsible for providing outstanding results. Many individuals have confirmed their gratification regarding using the Nikon Coolshot laser rangefinder which has helped them to turn into a better golfer. Therefore, do not give any second thoughts and get hold of this amazing rangefinder so as to improve your game by leaps and bounds.